Two victories were not enough for Porsche this weekend. Porsche followed Friday's dual WEC wins at Sebring with a win in Saturday's IMSA event. Following a hard-fought 12-hour race where the team yo-yo'd from first to last and back, Tandy, Pilet and Makowiecki (#911) crossed the finish line just under two seconds ahead of the second-place Ford GT. In the current hotly-contended GTLM environment, with intense competition from Ford, Chevrolet, and BMW, this achievement is nothing short of remarkable, and indicative of Porsche's exemplary strategy and driver team. This victory is the first time in IMSA history the same driver team has won Sebring in consecutive years. The #912 sister car of Bamber, Vanthoor, and Jaminet finished the race in fifth. Porsche's success in the IMSA event began in qualifying, with the Brumos-liveried #911 and #912 dominating the front row. Pilet and Vanthoor posted the fastest lap times in qualifying for the second round of the 2019 IMSA Weathertech SportsCar Championship. This is the first time two 911 RSRs have started on the first row at Sebring. Pilet took advantage of his fresh tires on his first fast lap, posting top times in all sectors of the course. In the #912 car, Laurens Vanthoor was slightly off the pace during his first fast lap, but qualified in second following his second fast lap. The pair qualified 0.143 seconds apart, with the top three qualifiers being separated by approximately 0.25 seconds. For the stats hungry, we do have a unique opportunity to compare the qualifying results of Porsche's IMSA and WEC entrants on the same track within a short span. Patrick Pilet's 1:55.89 second best lap bested Christensen's 1:57.384 fastest lap by about 1.5 seconds, with even the slower of the two IMSA cars out-qualifying the top WEC car. In the GTD class, Zacahrie Robichon qualified third in the Pfaff Motorsports 911 GT3 R, which he shares with Lars Kern and Scott Hargrove. Nicholas Boulle, sharing driving duties in the Park Place Motorsports 911R with Patrick Long and Patrick Lindsey, qualified 14th. 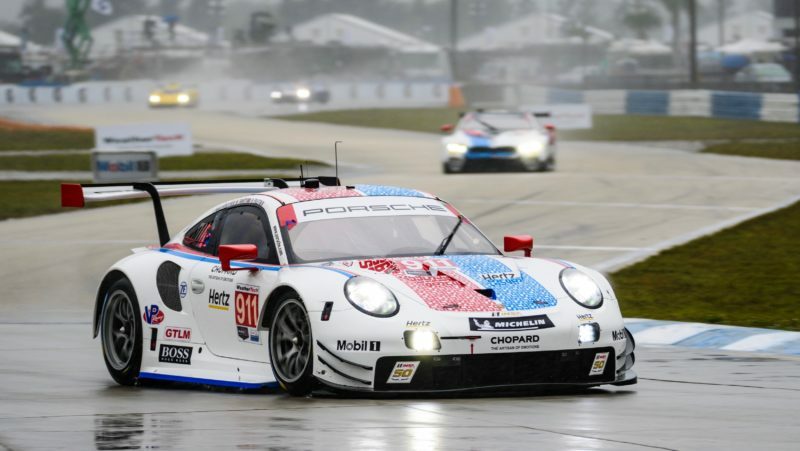 Where the previous day's WEC event ended in rain, the IMSA event began with a downpour. Not only was grip compromised, but visibility was limited by torrential Florida rain. Early race conditions saw the top-qualifying RSRs lose positions until conditions improved around the six-hour mark. The #911 car ultimately falling to last place in class, before a combination of a top-notch driver team, effective pit strategy, and sheer gumption saw the car return to the lead. The reigning GTLM champions, the #3 Corvette of Antonio Garcia and Jan Magnussen attempted a bold fuel strategy in the race's closing phases, only to be counteracted by a lengthy late-race caution. Denying the Corvette any opportunity to climb the grid in the race's final laps. The Pfaff Motorsports GT3 R led the GTD field for about half of the race. A lengthy pit stop due to a faulty sensor placed the #73 car in the pits for an extended period, ultimately losing the lead and resulting in a 10th place finish. The Park Place Motorsports entry driven by Long, Boulle, and Lindsey ran a very strong race, climbing from their 14th place qualifying position to a 6th place finish. Congratulation to them for marathon race. Being winner or not, the most important is you finished the marathon race. And one more time for the Brumos Racing tribute livery!